Beaphar Calming Spot On is a reliable, easy to use pipette which calms and reduces problem behaviour in dogs of all breeds and ages. Beaphar Calming Spot On is a herbal solution containing a valerian extract that will naturally calm your dog without having a sedative effect. 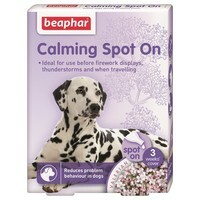 Beaphar Calming Spot is a quick and easy to use pipette to be applied between the dog’s ears, once a week for maximum effect. This pipette should begin working an hour after applying. Re-apply if the dog gets very wet as the effect of the drop will be diminished.